Small Wonders – Gothic Boxwood Miniatures was the special exhibit at the Cloisters, when we visited it this month. These small wonders were created at the dawn of the 16th-century, when Dutch artists transformed boxwood into something utterly new: tiny, intricate carvings, the likes of which had never been seen before. These creative geniuses took a material understood today as merely an ornamental plant and exploited its sculptural potential. In their hands, entire worlds emerged from dense and fine-grained wood. 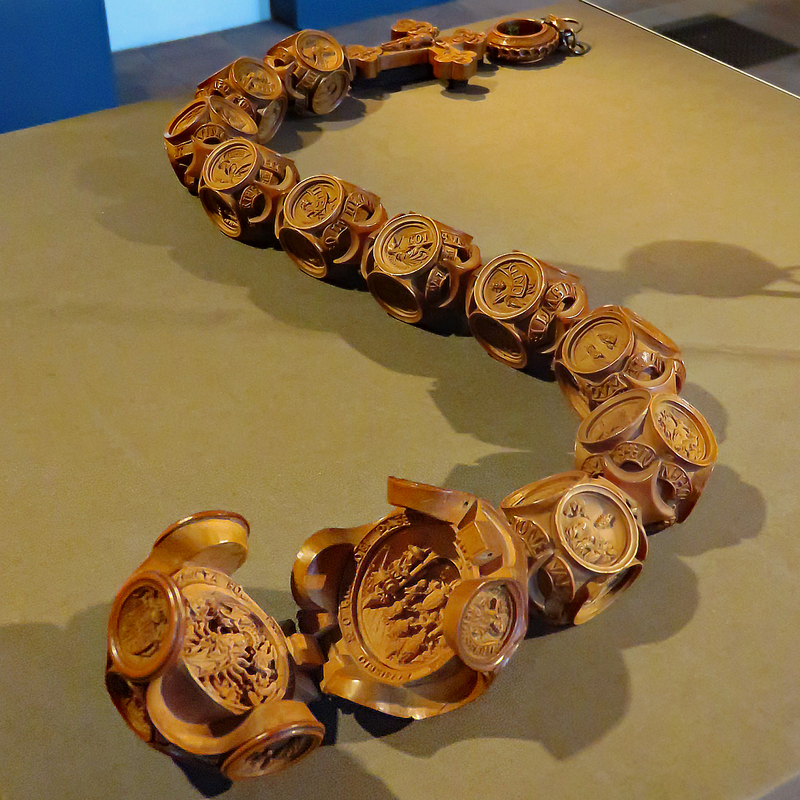 The pictured rosary is certainly the signature artwork of this exhibit. Leaving aside its historical significance, it is the largest and most complex work in the show. The largest, opened bead is about the size of a golf ball. Each of its eleven beads portrays one of the original twelve Apostles. Also portrayed are events from scripture. It bears the Royal Arms of England as well as the tiny letters “He8” and “Ka”, abbreviations for King Henry VIII and his first wife. This entry was posted in Art, History, Photo, Photography and tagged NYC, The Metropolitan Museum of Art by RegenAxe. Bookmark the permalink. It didn’t bring them closer together whatsoever.